Most of us know families that have produced multiple outstanding athletes, but few can rival the success of the 3 McDonald siblings. From 1970 to 1978, Jim, Cecelia, and Diane dominated the Illinois State Hula Hoop Championships. They flawlessly executed such moves as the “Stork,” “Alley Oop,” and the “Hula Hop,” along with performing a one-minute freestyle exhibition. Beginning in 1970, one of the McDonalds was crowned state champion each August when Jim and Cecelia won the local Oak Park contest at Barrie Park. Later, they both went on to be named Illinois State Champions. While none of them ever became the national champion, they did win the post-State Regionals on several occasions. As with any sport, practice makes perfect. The siblings, who lived in the block of 1100 South Harvey, reported that they prepared for upcoming competitions by devoting several hours each week to hula hooping, often practicing 3 hours a day prior to competitions. 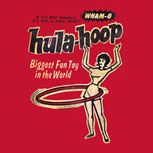 This hula-hooping dynasty also taught the sport at area park districts, for which the Wham-O Company (maker of hula hoops) shipped the trio a box of 40 new hula hoops to add to their already sizeable collection. For their hula hooping prowess, the 3 McDonald siblings were rewarded with trips, chances to compete for U.S. Savings Bonds and other prizes, and opportunities to meet celebrities. In 1978, Diane, the youngest daughter, reported meeting actress Elke Sommer at the Regional Championships in Saginaw, Michigan. The McDonalds' reign ended when they aged out of the competition that had an age limit of 15. Wham-O’s national contest continued for a few more years, finally ending in 1981. Sources: “His Goal Revolves around Hula Hoop,” Chicago Tribune, 1 August 1974; “Hula Hoop-er Stardom Runs in Family,” Chicago Tribune, 7 August 1974; “Hula Hoops Send Youth to Michigan,” Oak Leaves, 23 August 1978.